Mexican gray wolf F891, Chooli (pronounced "Hooly") was born at the Columbus Zoo in 2004. She was one of a litter of seven puppies. She lived most of her life at the California Wolf Center in Julian, California, many of those years with three of her sisters. She came to live at Southwest Wildlife in September of 2015. She's a gorgeous and wild wolf. Her brother M889 Nico also lives at our sanctuary. 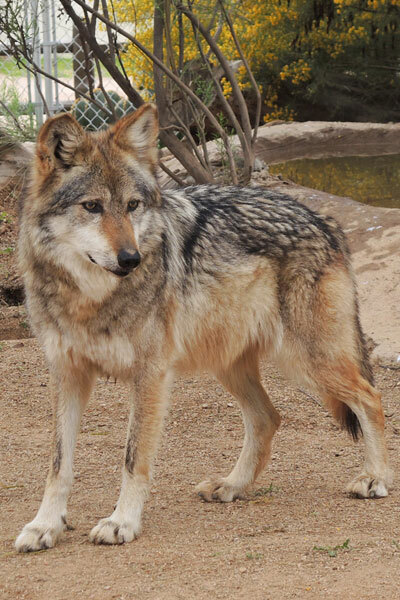 Chooli recently welcomed a male wolf, M877, Ghost, into her home. She and Ghost are enjoying people-watching from the large wolf enclosure near the Ramada. They appear to be a good match and we're thrilled that she'll have a companion to share her life with. Chooli was named recently by a long-time donor and supporter of our sanctuary.